Have you ever experienced yoga without music? Listening to music has become common place in the modern western practice of yoga, but Yoga One has gone against the norm. 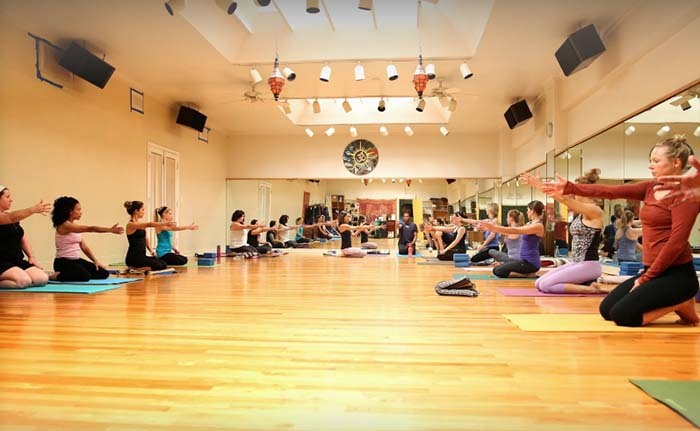 This yoga studio allows silence during practice because they feel it lets each student's mind wander and encourages reflection and self-realization. You are so lost in your own head that you don't even realize there's no music playing. The space is warm, not Birkram Hot Yoga warm, but warm from the serenity of the people. Natural light pours in from the skylight and for the first time you can feel the sunlight downtown without the shadows of skyscrapers. Yoga One is a family owned yoga studio the prides itself on diversity, innovation and the phenomenal hugs they give each yogi at the end of class as they leave the quiet sunbathed space and venture back onto the bustling streets below. The studio is tucked away on busy Seventh St, which normally means that parking can be treacherous, but you don't need excellent parking karma to attend this class on time. This member-centric yoga studio offers a downtown parking cheat sheet that even includes ways to get there via public transit and places where parking is free in nearby neighboorhoods. If you are looking for the most relaxing Shivasana of your life, this is your yoga studio. Cost: $18/class. Students, military and senior discount: $13/class. Drop ins are always welcome! More pricing options here. Older PostFit Athletic- San Diego Locations.